British-israel.us -- Is Anything Too Hard For the Lord? 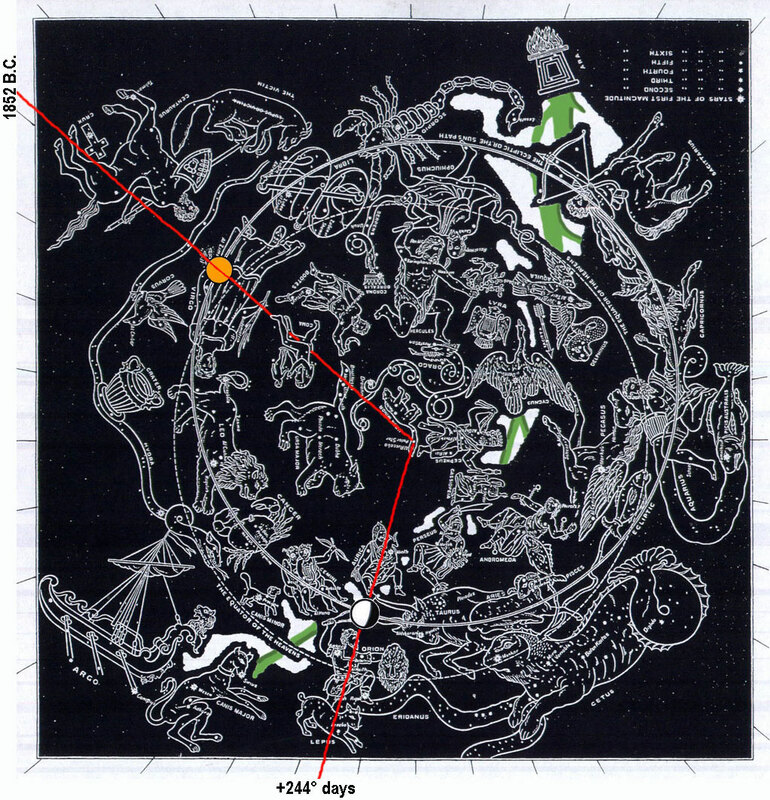 Genesis chapter 18 Star Chart: Clockwise from when "Abraham (Orion) hastened into the (red radius) tent unto (Virgo) Sarah, and said, Make ready quickly three measures of fine meal, knead it, and make cakes upon the hearth" (18:6) and Abraham (red radius) "took (solar yellow) butter, and (lunar white) milk, and the (Taurus) calf which he had dressed, and set it before them (Castor, Pollux and Auriga); and he (Orion-Abraham) stood by them under the (Mulberry -- Cancer) tree, and they did eat" (18:8) and Sarah became pregnant that very day in 1852 B.C. till "Sarah (Virgo) thy wife shall have a (Coma) son" (18:10) is 244° days later in 1851 B.C. 5 And I will fetch a (solar golden) morsel of bread, and comfort ye your hearts; after that ye shall pass on: for therefore are ye come to your servant. And they said, So do, as thou hast said. 6 And Abraham (Orion) hastened into the (red radius) tent unto (Virgo) Sarah, and said, Make ready quickly three measures of fine meal (two solar halves and one lunar gibbous measure), knead it, and make cakes upon the hearth. 7 And Abraham ran unto the (Taurus-Aries) herd, and fetcht a (Taurus) calf tender and good, and gave it unto a young man; and he hasted to dress it. 9 And they said unto him, Where is Sarah (Virgo) thy wife? And he said, Behold, in the (red radius) tent. 10 And he said, I will certainly return unto thee according to the time of life (244-day pregnancy); and, lo, Sarah (Virgo) thy wife shall have a (Coma) son. And Sarah (Virgo) heard it in the (red radius) tent door, which was behind him. 11 Now Abraham (Auriga) and Sarah (Virgo) were old and well stricken in age; and it ceased to be with Sarah (Virgo) after the manner of women. 12 Therefore Sarah (Virgo) laughed within herself, saying, After I am waxed old shall I have pleasure, my lord (Auriga) being old also? 14 Is any thing too hard for the Lord? At the time appointed I will return unto thee, according to the time of life (244 days -- 1851 B.C. ), and Sarah (Virgo) shall have a son. 15 Then Sarah (Virgo) denied, saying, I laughed not; for she was afraid. And he said, Nay; but thou didst laugh. 16 And the men (Gemini) rose up from thence, and looked toward Sodom: and Abraham went with them to bring them on the way. 19 For I know him (Orion), that he will (red radius) command his (Auriga and Coma) children and his household after him, and they shall keep the way of the Lord, to do justice and judgment; that the Lord may bring upon Abraham that which he hath spoken of him. 22 And the (Gemini) men turned their faces from thence, and went toward Sodom: but Abraham stood yet before the Lord. 23 And Abraham drew near, and (red radius) said, Wilt thou also destroy the righteous with the wicked? 26 And the Lord (red radius) said, If I find in Sodom fifty righteous within the city, then I will spare all the place for their sakes. 28 Peradventure there shall lack five of the fifty righteous: wilt thou destroy all the city for lack of five? And he (red radius) said, If I find there forty and five, I will not destroy it. 29 And he (red radius) spake unto him yet again, and said, Peradventure there shall be forty found there. And he said, I will not do it for forty's sake. 30 And he (red radius) said unto him, Oh let not the Lord be angry, and I will speak: Peradventure there shall thirty be found there. And he (red radius) said, I will not do it, if I find thirty there. 31 And he (red radius) said, Behold now, I have taken upon me to speak unto the Lord: Peradventure there shall be twenty found there. And he (red radius) said, I will not destroy it for twenty's sake. 32 And he (red radius) said, Oh let not the Lord be angry, and I will speak yet but this once: Peradventure ten shall be found there. And he (red radius) said, I will not destroy it for ten's sake. Some of the Jewish writers say (g), he ended at ten, because he supposed there were ten righteous persons in Lot's family, Lot and his wife, and their four daughters, and their four husbands; but they forgot that two of Lot's daughters were unmarried, and how many he had married is not known; ten they say make a congregation, and wherever there are ten righteous persons, a place is saved for their sakes. (g) Bereshit Rabba, sect. 49. fol. 44. 3.